Clovis is what archaeologists call the oldest widespread archaeological complex in North America. Named after the town in New Mexico near where the first accepted Clovis site Blackwater Draw Locality 1 was discovered, Clovis is most well-known for its stunningly beautiful stone projectile points, found all over the United States, northern Mexico, and southern Canada. Clovis technology was not likely the first in the American continents: that was the culture called Pre-Clovis, who arrived before Clovis culture at least one thousand years earlier and are likely ancestral to Clovis. While Clovis sites are found throughout North America, the technology only lasted for a brief period of time. The dates of Clovis vary from region to region. In the American west, Clovis sites range in age from 13,400-12,800 calendar years ago BP [cal BP], and in the east, from 12,800-12,500 cal BP. The earliest Clovis points found so far are from the Gault site in Texas, 13,400 cal BP: meaning Clovis-style hunting lasted a period of time no longer than 900 years. There are several long-standing debates in Clovis archaeology, about the purpose and meaning of the egregiously gorgeous stone tools; about whether they were solely big game hunters; and about what made Clovis people abandon the strategy. Clovis points are lanceolate (leaf-shaped) in overall shape, with parallel to slightly convex sides and concave bases. The edges of the hafting end of the point are usually ground dull, likely to prevent the cord haft lashings from being cut. They vary quite a bit in size and form: eastern points have wider blades and tips and deeper basal concavities than do points from the west. But their most distinguishing characteristic is fluting. On one or both faces, the flintknapper finished the point by removing a single flake or flute creating a shallow divot extending up from the base of the point typically about 1/3 of the length towards the tip. The fluting makes an undeniably beautiful point, especially when performed on a smooth and shiny surface, but it is also a remarkably costly finishing step. Experimental archaeology has found that it takes an experienced flintknapper half an hour or better to make a Clovis point, and between 10-20% of them are broken when the flute is attempted. Archaeologists have contemplated the reasons Clovis hunters might have had for creating such beauties since their first discovery. In the 1920s, scholars first suggested that the long channels enhanced bloodletting--but since the flutes are largely covered by the hafting element that's not likely. Other ideas have also come and gone: recent experiments by Thomas and colleagues (2017) suggest that the thinned base might have been a shock absorber, absorbing physical stress and preventing catastrophic failures while being used. 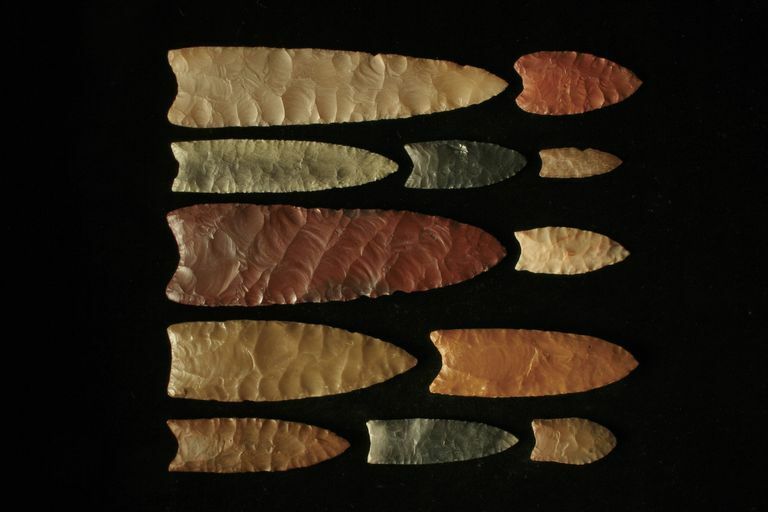 Clovis points are also typically made from high-quality materials, specifically highly siliceous crypto-crystalline cherts, obsidians, and chalcedonies or quartzes and quartzites. The distance from where they have been found discarded to where the raw material for the points came is sometimes hundreds of kilometers away. There are other stone tools on Clovis sites but they are less likely to have been made of the exotic material. Having been carried or traded across such long distances and being a part of a costly manufacturing process leads scholars to believe that there was almost certainly some symbolic meaning to the use of such these points. Whether it was a social, political or religious meaning, some sort of hunting magic, we will never know. What modern archaeologists can do is look for indications of how such points were used. There is no doubt that some of these points were for hunting: the point tips often exhibit impact scars, which likely resulted from thrusting or throwing against a hard surface (animal bone). But, microwear analysis has also shown that some were used multifunctionally, as butchery knives. Archaeologist W. Carl Hutchings (2015) conducted experiments and compared impact fractures to those found in the archaeological record. He noted that at least some of the fluted points have fractures that had to have been made by high-velocity actions: that is, they were likely fired using spear throwers (atlatls). Since the first unequivocal discovery of Clovis points in direct association with an extinct elephant, scholars have assumed that Clovis people were "big game hunters", and the earliest (and likely last) people in the Americas to rely on megafauna (large bodied mammals) as prey. Clovis culture was, for awhile, blamed for the late Pleistocene megafaunal extinctions, an accusation that no longer can be leveled. Although there is evidence in the form of single and multiple kill sites where Clovis hunters killed and butchered large-bodied animals such as mammoth and mastodon, horse, camelops, and gomphothere, there is growing evidence that although Clovis were primarily hunters, they didn't rely solely on or even largely on megafauna. Single-event kills simply don't reflect the diversity of foods that would have been used. Using rigorous analytical techniques, Grayson and Meltzer could only find 15 Clovis sites in North America with irrefutable evidence for human predation on megafauna. A blood residue study on the Mehaffy Clovis cache (Colorado) found evidence for predation on extinct horse, bison, and elephant, but also birds, deer and reindeer, bears, coyote, beaver, rabbit, bighorn sheep and pigs (javelina). Scholars today suggest that like other hunters, although larger prey might have been preferred because of greater food return rates when the large prey wasn't available they relied on a much broader diversity of resources with an occasional big kill. Five types of Clovis sites have been found: camp sites; single event kill sites; multiple-event kill sites; cache sites; and isolated finds. There are only a few campsites, where Clovis points are found in association with hearths: those include Gault in Texas and Anzick in Montana. Single event kill sites (Clovis points in association with a single large-bodied animal) include Dent in Colorado, Duewall-Newberry in Texas, and Murray Springs in Arizona. Multiple kill sites (more than one animal killed at the same location) include Wally's Beach in Alberta, Coats-Hines in Tennessee and El Fin del Mundo in Sonora. Cache sites (where collections of Clovis-period stone tools were found together in a single pit, lacking other residential or hunting evidence), include the Mehaffy site, the Beach site in North Dakota, the Hogeye site in Texas, and the East Wenatchee site in Washington. Isolated finds (a single Clovis point found in a farm field) are too numerous to recount. The only known Clovis burial found to date is at Anzick, where an infant skeleton covered in red ochre was found in association with 100 stone tools and 15 bone tool fragments, and radiocarbon dated between 12,707-12,556 cal BP. There is some evidence for ritual behavior beyond that involved with making Clovis points. Incised stones have been found at Gault and other Clovis sites; pendants and beads of shell, bone, stone, hematite and calcium carbonate have been recovered at Blackwater Draw, Lindenmeier, Mockingbird Gap, and Wilson-Leonard sites. Engraved bone and ivory, including beveled ivory rods; and the use of red ochre found at the Anzick burials as well as placed on animal bone are also suggestive of ceremonialism. There are also some currently undated rock art sites at Upper Sand Island in Utah which depict extinct fauna including mammoth and bison and may be associated with Clovis; and there are others as well: geometric designs in Winnemucca basin in Nevada and carved abstractions. The end of the big game hunting strategy used by Clovis appears to have occurred very abruptly, connected with the climate changes associated with the onset of the Younger Dryas. The reasons for the end of big game hunting is, of course, the end of big game: most of the megafauna disappeared about the same time. Scholars are divided about why the big fauna disappeared, although currently, they are leaning towards a natural disaster combined with climate change that killed off all the large animals. One recent discussion of the natural disaster theory concerns the identification of a black mat marking the end of Clovis sites. This theory hypothesizes that an asteroid landed on the glacier that was covering Canada at the time and exploded causing fires to erupt all over the dry North American continent. An organic "black mat" is in evidence at many Clovis sites, which is interpreted by some scholars as ominous evidence of the disaster. Stratigraphically, there are no Clovis sites above the black mat. However, in a recent study, Erin Harris-Parks found that black mats are caused by local environmental changes, specifically the moister climate of the Younger Dryas (YD) period. 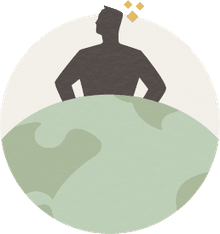 She noted that although black mats are relatively common throughout the environmental history of our planet, a dramatic increase in the number of black mats is apparent at the onset of the YD. That indicates a rapid local response to YD-induced changes, driven by significant and sustained hydrologic changes in the southwestern US and High Plains, rather than cosmic catastrophes. Grayson DK, and Meltzer DJ. 2015. Revisiting Paleoindian exploitation of extinct North American mammals. Journal of Archaeological Science 56:177-193. Hamilton M, Buchanan B, Huckell B, Holliday V, Shackley MS, and Hill M. 2013. Clovis Paleoecology and Lithic Technology in the Central Rio Grande Rift Region, New Mexico. American Antiquity 78(2):248-265. Harris-Parks E. 2016. The micromorphology of Younger Dryas-aged black mats from Nevada, Arizona, Texas and New Mexico. Quaternary Research 85(1):94-106. Heintzman PD, Froese D, Ives JW, Soares AER, Zazula GD, Letts B, Andrews TD, Driver JC, Hall E, Hare PG et al. 2016. Bison phylogeography constrains dispersal and viability of the Ice Free Corridor in western Canada. Proceedings of the National Academy of Sciences 113(29):8057-8063. Hutchings WK. 2015. Finding the Paleoindian spearthrower: quantitative evidence for mechanically-assisted propulsion of lithic armatures during the North American Paleoindian Period. Journal of Archaeological Science 55:34-41. Lemke AK, Wernecke DC, and Collins MB. 2015. Early Art in North America: Clovis and Later Paleoindian Incised Artifacts from the Gault Site, Texas (41bl323). American Antiquity 80(1):113-133. Rasmussen M, Anzick SL, Waters MR, Skoglund P, DeGiorgio M, Stafford Jr TW, Rasmussen S, Moltke I, Albrechtsen A, Doyle SM et al. 2014. The genome of a Late Pleistocene human from a Clovis burial site in western Montana. Nature 506:225-229. Sanchez G, Holliday VT, Gaines EP, Arroyo-Cabrales J, Martinez-Taguena N, Kowler A, Lange T, Hodgins GWL, Mentzer SM, and Sanchez-Morales I. 2014. Human (Clovis)-gomphothere (Cuvieronius sp.) association approximately 13,390 calibrated yBP in Sonora, Mexico. Proceedings of the National Academy of Sciences 111(30):10972-10977. Shott MJ. 2013. Human colonization and late pleistocene lithic industries of the Americas. Quaternary International 285:150-160. Speer CA. 2014. LA-ICP-MS analysis of Clovis period projectile points from the Gault Site. Journal of Archaeological Science 52:1-11. Speth JD, Newlander K, White AA, Lemke AK, and Anderson LE. 2013. Early Paleoindian big-game hunting in North America: Provisioning or Politics? Quaternary International 285:111-139. Surovell TA, Boyd JR, Haynes CV, and Hodgins GWL. 2016. On the dating of the folsom complex and its correlation with the Younger Dryas, the end of Clovis, and megafaunal extinction. PaleoAmerica 2(2):81-89. Thomas KA, Story BA, Eren MI, Buchanan B, Andrews BN, O'Brien MJ, and Meltzer DJ. 2017. Explaining the origin of fluting in North American Pleistocene weaponry. Journal of Archaeological Science 81:23-30. Yohe II RM, and Bamforth DB. 2013. Late Pleistocene protein residues from the Mahaffy cache, Colorado. Journal of Archaeological Science 40(5):2337-2343.